Print spring calendars, reading comprehension stories, word puzzles, and learning center activities. Cut out the letters in the words "Happy Spring." How many new words can you make by mixing up the letters? This printable includes primary-ruled paper for students in grades 1 and 2. Makes a great learning center. Cut out the letter squares in the words "Happy Spring." Rearrange the letters to make new words. How many 3, 4, and 5-letter words can you make? This printable includes intermediate-ruled paper for students in grades 3 through 6. One, two or three students can play this addition game. Players take turns finding pairs of numbers that ad up to fifteen. (11+4, 10+5, 9+6, 8+7, etc.) This game has a spring flower theme. 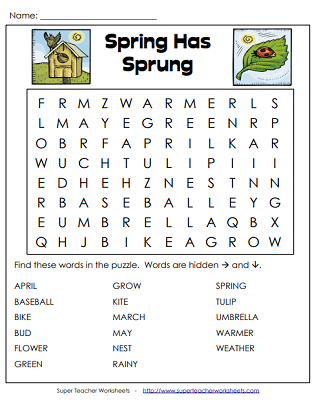 This spring word search has easy-to-read words hidden in it. All words are hidden across and down only. There are no diagonal or backwards words. Specially designed for students in 1st and 2nd grades. Find the words home plate, strike, batter, catch, pitcher, shortstop, and coach hidden in this puzzle. This intermediate puzzle has words hidden across, down, and diagonally. Recommended for grades 3 through 6. Write each list of words in ABC order. Each word list has words that start with different letters. (example: spring, rain, warm, flower) Recommended for grades 1 and 2. You've heard the phrase, "The early bird catches the worm." However, that's not the case in this story. Jill is collecting rocks, but she's afraid to pick up rocks with creepy crawly bugs on them. Her fearless brother Ben follows her around and makes a collection of his own. Learn all about colorful tulips that grow in the springtime. Spencer wants to spend day off of school riding bikes with his best friend, but a spring rainstorm ruins his plans. Or does it? With a little creative thinking, Spencer and Elton may be able to ride after all. Learn about a monarch butterfly's metamorphosis as it transforms from a caterpillar into a butterfly. While tossing a baseball back and forth with her sister, this girl makes an amazing catch. This poem has a fun twist at the end that kids enjoy. Andy can almost feel the first place medal around his neck, but when the last challenge of the field day is a hula hooping competition, Andy will learn what it means to be a true field day champion. Do you know why ladybugs are called Ladybugs? You'll know after you read this fascinating article. When students solve basic addition problems, they'll be able to decode a picture of a mother bird sitting on her eggs. Find the sum for each basic addition fact. The color the picture according to the key at the bottom of the worksheet. The mystery picture shows a ladybug. Subtract to find the difference. Then color each section of the illustration according to the key. The finished picture is a butterfly. Subtract the pairs of numbers. Write the answers on the mystery picture. Color to reveal a beautiful ladybug. 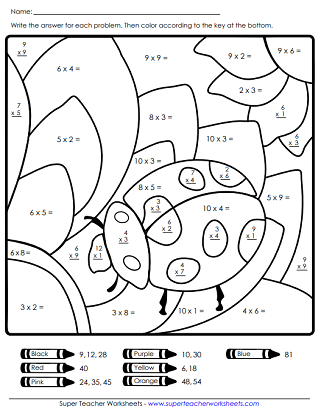 Have your students practice their basic subtraction skills with this spring-themed worksheet. Minuends are 20 or less. This mystery picture has multiplication facts up to 10. The final picture shows a red bird sitting in her nest with blue eggs. Multiply each pair on numbers on the mystery picture. Then match your answers with the color code at the bottom of the page. Use crayons to color the picture according to the key. Divide to solve each problem. Write the answers on the picture, then color according to the key at the bottom. Plot the points on the coordinate plane and connect the dots to reveal a surprise picture. The picture shows two spring flowers. Color the March calendar and add the numbered dates. Calendar includes a picture of shamrocks and a leprechaun. April showers bring May flowers. Color and number the April calendar, then add important days, like holidays and birthdays. Color the picture of May flowers, then number the calendar's dates. Cut out twenty-five word cards. Rearrange them to make as many complete sentences as possible. Some word cards have basic sight words, including see, we, to, the she, you, play, the, will, and like. Other cards have words related to spring, such as outside, grow, flower, rain, and nest. Cut out the word boxes and rearrange them to make a sentence. Glue the words onto the paper and write the sentence. The sentence reads, "Flowers grow in the spring." Cut out the words and use them to make a sentence. Glue the words on the paper and write your sentence. The sentence reads, "Can you fly the kite?" This single-page worksheet includes 16 different spring writing prompts for students to choose from. On this graphic organizer, students write about the sights, tastes, smells, and sounds of springtime. Write a story to go along with the illustration. The scene shows a boy looking up at his kite, which is caught in a tall tree. Write a story to go along with the picture. The illustration shows a girl chasing butterflies with a net. Students can use this raindrops sticker chart to count books they've read, track behavior, or keep track of their completed homework. Keep track of homework assignments, behavior, or books of this flower sticker chart. Use these wristbands to help students remember their library books, lunch money, field trips, or anything at all. Print worksheets for all four seasons and every major holiday. Each spring millions of students observe caterpillars transform into butterflies. We have lots of printables for learning about butterfly life cycles. We have a bunny craft, Easter puzzles, coloring pages, and much more. Earth Day is coming on April 22. STW has a fun collection of Earth Day worksheets, printable puzzles, and activities. 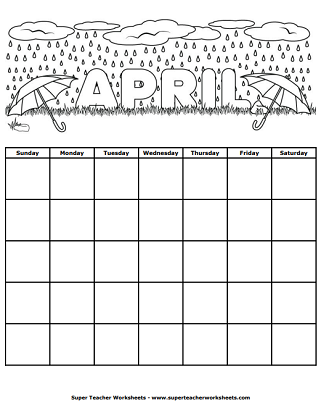 Kids can make and color their own calendar for each month of the year.